In 2016, Texas Agriculture Commissioner Sid Miller irked farmers, ranchers and lawmakers by dramatically raising fees for a wide range of services his agency offers. A new state audit says the higher fees generated millions more dollars than necessary in 2016, via Texas Tribune. 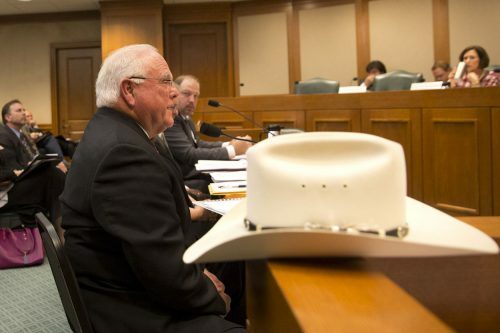 Nearly two years ago, Texas Agriculture Commissioner Sid Miller irked farmers, ranchers and lawmakers by dramatically raising fees for a wide range of services his agency offers. At the time, Miller, a Republican, said his Department of Agriculture was hemorrhaging cash and needed more revenue to keep various agriculture and consumer protection programs open. The higher fees, it turns out, generated millions more dollars than those programs cost to operate in 2016, and the department had no formal process for ensuring it was charging fees in line with costs, according to a state audit report made public Tuesday. The fees generated $27.3 million during the 2016 calendar year, while programs that rely on such fees cost just $20.8 million to operate — which means Miller’s agency collected $6.5 million more than necessary, or 31 percent, according to the report by the State Auditor’s Office. Meanwhile, “as of March 17, 2017, the Department had not compared its actual revenues and expenditures to evaluate whether it set its fees appropriately,” the report said. In a letter responding to the audit, Miller generally agreed with recommendations to improve the way the agency sets new fees, but he took issue with the auditor’s finding of a significant mismatch between revenue and expenses. The audit didn’t take into account various cost-saving efforts at the department, Miller wrote. Miller also suggested that a large part of the sum the audit identified as unnecessary — $4.6 million his agency earmarked for “cash flow” and “unanticipated costs” — was part of his agency’s prudent budgeting. “You certainly would not want to plan for a loss!” his letter said. The fee hikes in question took effect on Jan. 1, 2016, over loud objections from the agriculture community and lawmakers who called the changes too drastic and said the fees would unduly wallop farmers, ranchers and businesses. The fee hikes ranged widely, in many cases by hundreds of dollars; some more than doubled. Renewing a grain warehouse license, for instance, now costs $500, up from $235. And prices for field inspections to certify seeds increased anywhere from a few cents to more than a dollar per acre. Miller has argued the Legislature left his agency underfunded and increasingly dependent on fees by slashing its budget by about one-third in 2011, leaving as many as 100 agency positions unfilled and putting it behind in its regulatory duties. Critics have pointed out that Miller championed past cuts to the department that he now leads during his days in the Texas House. Loeffler said the department would update its practices before it revises its fees, which could be soon, and it was working on the issue even before the audit. Last month, Miller announced he had directed staff to find ways to lower some fees, saying the agency had cut costs in several ways, such as by making agency inspections more efficient and tracking down businesses that haven’t paid to register their scales. “I’ve been able to achieve some cost savings and managed our budget well, so just like a business, we’re passing that along to our ag producers and taxpayers by way of fee reductions,” Miller said in a press release last month. The press release was circulated on Aug. 22, one day after Miller dated his letter to the auditor’s office. But Loeffler said Miller’s directive to reduce fees came independently and was not related to findings in the audit. This entry was posted in KRTS Music, KXWT News and tagged Sid Miller, Texas Agriculture. Bookmark the permalink.